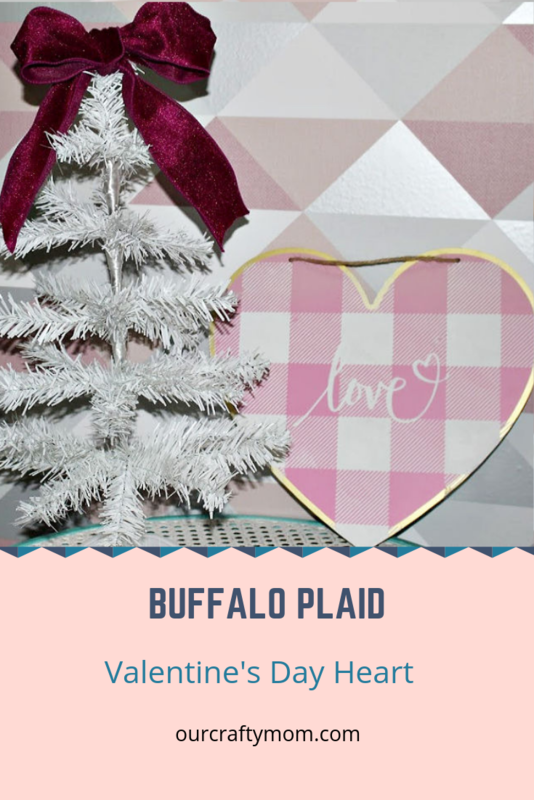 With Valentine’s Day just a couple of weeks away, I made a quick and easy buffalo plaid Valentine’s Day Heart using Chalk Couture products and a Dollar Spot find! 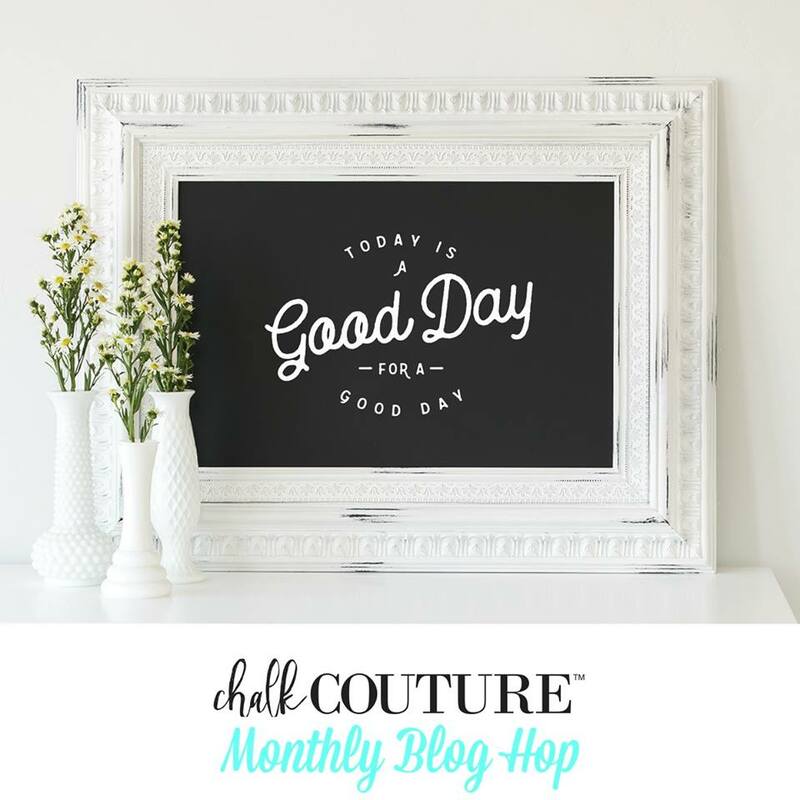 Hello and welcome to our first Chalk Couture Monthly Blog Hop! 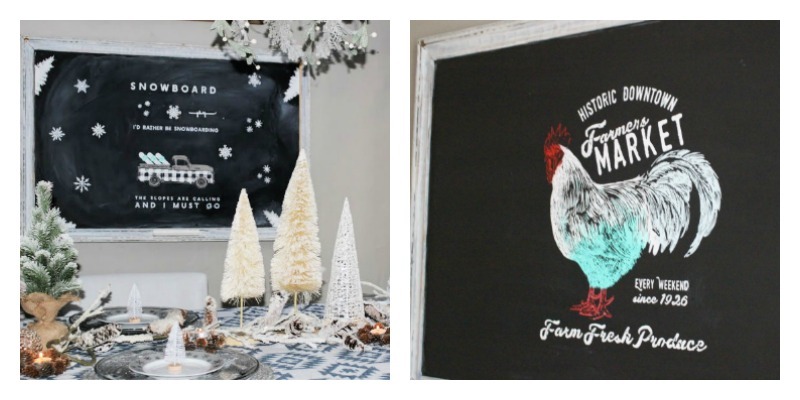 If you’ve visited here before, you may have seen some of the projects I’ve made using Chalk Couture. 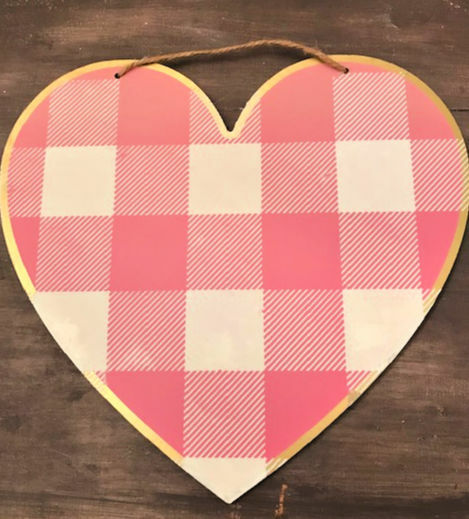 But if you haven’t, at the end of this post I have a short video which showcases some of the projects I’ve created, from pillows to signs to Christmas ornaments! Just in case you haven’t picked up on my excitement about this product yet, I will say it right now-I am so EXCITED to be a Chalk Couture Designer. 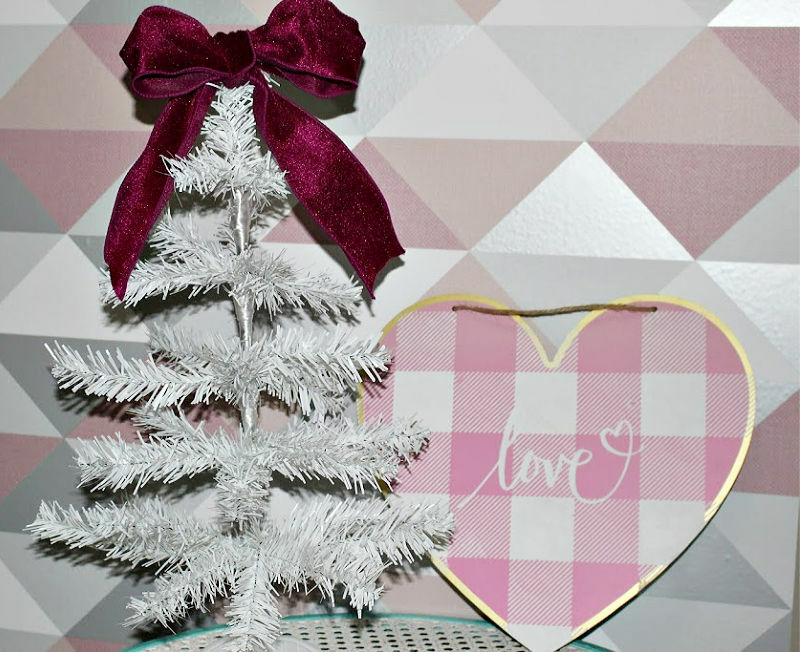 I am all about quick and easy crafts and home decorating ideas. In a nutshell, that is why I love Chalk Couture so much. 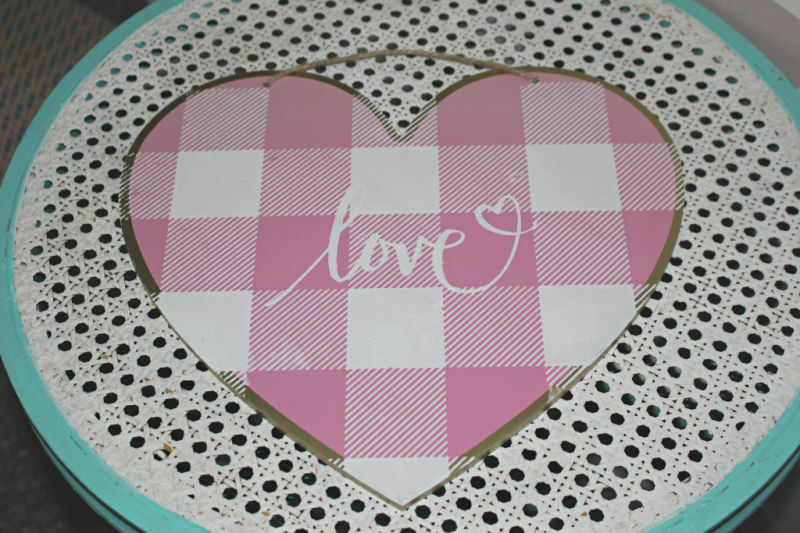 You can literally make a beautiful sign like the one pictured below in under 15 minutes! The Farmer’s Market (rooster) was the first large transfer I used and I loved how it turned out. I left this up through Thanksgiving and then washed it off and switched up to the Winter Snowboard Scene. For someone who get’s bored easily with their home decor, this is a dream! You read that right! You can reuse the transfers at least 8-12 times with proper care, which is basically cleaning them with cool water after use. As Chalk Couture sells both chalkology ink and chalkology paste, it is important to know what product to use on different surfaces. For anything fabric, like pillows, tablecloths, etc. always use ink. Heat set it to make it permanent! Paste is safe to use and remove from most non-porous surfaces, such as chalkboards, glass, metal, even painted walls. Paste can also be used on porous surfaces such as unfinished wood or paper, but only as a permanent design. 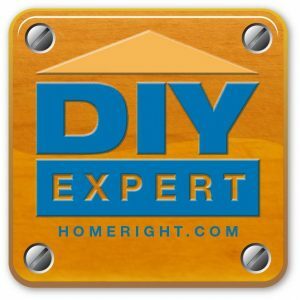 If you want to make your beautiful design last forever, apply a sealant! And used the small squeegee to add chalk and scrape any excess, which you can scrape back into the container. That is another plus-a little goes a long way! Finally, I used the same process to add the love heart. This was done in no time and I think it turned out adorable. I will add a clear sealant as I do want this to be permanent. This is something I will look forward to bringing out each Valentine’s Day. Also, If you are looking for unique Valentine’s Day gift idea for your kids or someone special in your life, I wanted to let you know about a really cool company called Tee Public. Although my children are grown, I still like to give them a little something on Valentine’s Day. 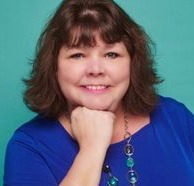 So when Tee Public reached out to me about collaborating, I was thrilled when I saw all the cool stuff on their website. It is not just t-shirts, though there are plenty of those, including the classic music collection that my Son just loves. Check out this Led Zeppelin t-shirt and plenty of anime items like this Pocket Teto Tote Bag, that will be for my daughter. She is obsessed with Studio Ghibli and they have a great collection. This bag will be filled with a few Valentine’s Day Treats. Although this is a collaboration with Tee Public, I only promote product I believe in. Also, as a first time buyer you can get 15% off your order for a limited time. Enjoy! Thank you so much for stopping by. I hope you enjoyed this quick and easy craft and will follow along with us for this monthly challenge. Have a great day! You can’t go wrong with buffalo check – especially when pink is involved!!! Pinned! Yes! I love pink 🙂 Thanks for joining in! Buffalo check is my favorite! Love it! Yes! I need to order another one, as I’ve used this so much. Thanks for joining in! Adorable! I wish I had a Target in my town. My Target is about 30 minutes away, but it is worth the trip. You can’t beat their Dollar Spot! It turned out great. 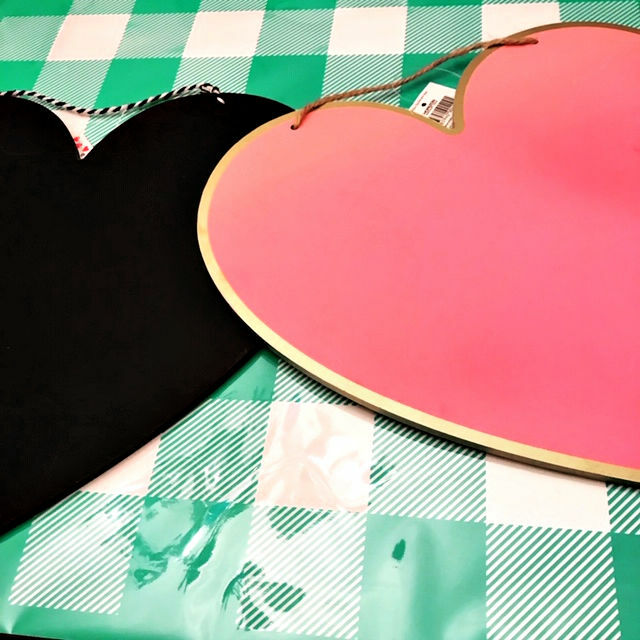 If you don’t have a Target nearby, Dollar Tree has red hearts with a chalk board center. 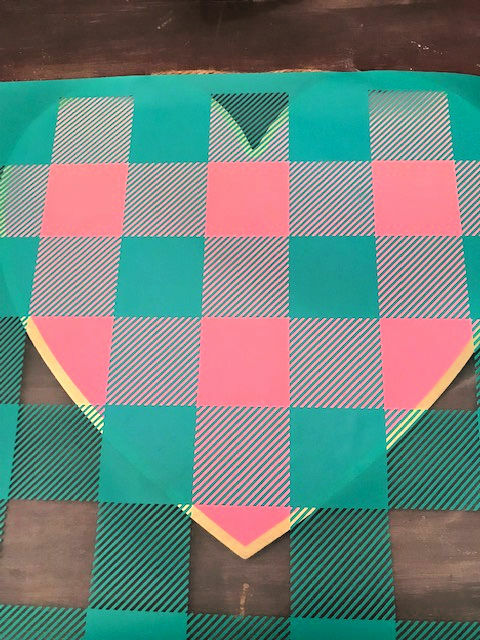 I love the pink buffalo plaid heart! I was just in the Target Dollar Spot and don’t remember seeing those hearts. Just means I have to go back! Oh I want that buffalo plaid stencil. Love your little craft.